Every January, I make it a point to share a crock-pot recipe in honor of National Slow Cooking Month. With my husband's surgery earlier this month, January almost got away from me this year. I like to vary the recipes I share and not post similar recipes close together. However, I'm going to break that unofficial rule today and share another recipe that uses ground beef. It's quite different from the Sweet and Sour Meat Loaf recipe I posted earlier this week. 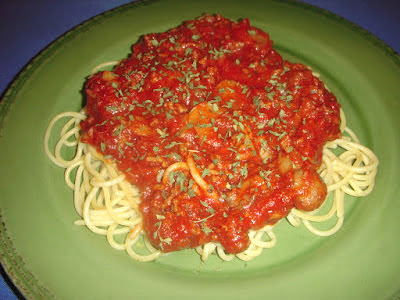 Homemade spaghetti sauce is one of my favorite cold weather recipes. It only requires a little prep work, is quick to assemble and can easily be doubled. It's also the best spaghetti sauce I've ever eaten! Over the last 20 years, I've adapted the recipe to suit our tastes. The easiest adaptation I made was to move the sauce from the stove top to the crock-pot. If you're making one batch of sauce, you'll need a 3 1/2 to 4-quart crock-pot. If you double it like I do, you'll need a 6-quart crock-pot. Although I don't brown roast beef or chicken before I cook them in a crock-pot, I always brown ground beef before using it in a crock-pot. Spaghetti sauce doesn't take as long to cook as roast beef or chicken, so I want to make certain the meat is fully cooked. Browning the meat beforehand gives me that peace of mind. It also gives me the opportunity to drain off the grease so it won't be in the finished sauce. The easiest way to drain the grease is to set a colander inside a large bowl and pour the meat mixture into the colander. I let the meat drain while I prep the other ingredients. Grease from two pounds of extra lean ground chuck. Once the grease is drained, the meat and onion are combined with the remaining ingredients. Unlike many spaghetti sauce recipes, this one doesn't use crushed or diced tomatoes. It uses tomato sauce and tomato paste instead. It can be difficult to get all the tomato paste out of the can, so I want to share a trick my mother taught me when I first started cooking. Open one end of the can of tomato paste. Leaving the lid in place, turn the can upside down and open the other end. Remove this lid, turn the can upside down over your mixing bowl or pan and use the lid on the other end to push the tomato paste out of the can. The sauce is seasoned with oregano, garlic powder and a package of Italian style spaghetti sauce mix. Sometimes I can't find Italian style spaghetti sauce mix so I use a package of thick and zesty spaghetti sauce mix instead. A little bit of sugar is added to the sauce to help cut down on the acidity of the tomato sauce and tomato paste. The only other ingredients are the liquid and canned mushrooms. To give the finished sauce more flavor, I drain and reserve the mushroom liquid, adding enough water to it to equal the amount called for in the recipe. Liquid from two (8 ounce) cans of mushrooms. If you don't like mushrooms, you can leave them out and just add water to the sauce. Once everything is thoroughly combined, cook the sauce three to four hours on high, or six hours on low until the sauce is heated through. The last 30 minutes of cooking, I fix the pasta and garlic bread and assemble the salad. I always double this sauce so I can freeze some to use later in the year. To do this, I refrigerate the sauce overnight so it's completely cold. The next day, I ladle the sauce into a freezer safe, resealable plastic bag, making sure I date and label the contents. The sauce expands as it freezes so don't fill the bag completely full; leave about an inch of headspace. To save space in the freezer, I freeze the bag flat. I have a chest freezer so it's not always easy to find a spot to lay the bag flat. To solve this problem, I put the bag on a cookie sheet and put the cookie sheet in the freezer overnight. To use the frozen spaghetti sauce, thaw it in the refrigerator overnight. It can be reheated on the stove top or, what I do, in the crock-pot. Either way, you'll need to add some additional water to the sauce when it's reheated. I've often wondered why January is National Slow Cooking Month. I finally decided it must be because a lot of people only use their crock-pots in the summer when they don't want to heat up the kitchen. National Slow Cooking Month is a great way to remind people to use their crock-pots in cold months too. Even better, use this time saving appliance all year round! Cook and stir the ground beef and onion in a large pan until the meat is brown and the onion is tender; drain. Combine the meat and onion with the remaining ingredients. Cook in a crock-pot for 3 to 4 hours on high, or 6 hours on low until the sauce is heated through. Serve over hot spaghetti. Recipe can be doubled. Leftover sauce can be frozen. Your Mom must have gone to cooking school with my Grandma...we learned many of the same things from them. My mom was a great cook and had a plethora of cooking tips and tricks. I just wish I would have listened more when I was younger!